One of the coolest stations i have ever seen. Architecture fascinates most people. Beautiful lines and shapes that has to appeal to the eye but at the same time be functional for a home, an office or as in this case, a train station. Architecture is always beautiful in black and white since it strips away everything except the lines, the lights and the contrasts. 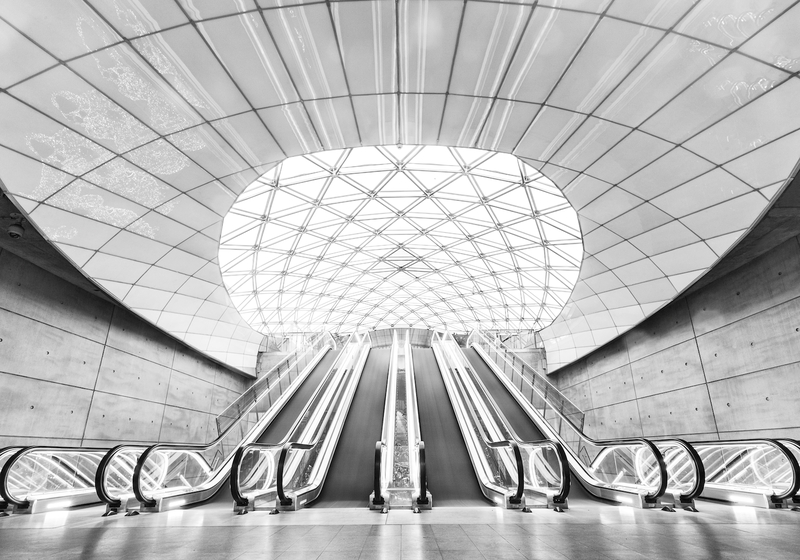 This image from the train station Triageln in Malmö is one of our best-selling architecture photographs. Symmetry and leading lines makes it very eye-catching and decorative. Those who like to decorate their home with black and white photo art have a great start here. For those who look a little closer at the escalators will pretty fast notice that there is something special about this picture. It is photographed with a slow shutter speed, so that the steps have been worn out and almost look like a treadmill. This print suits very well with a white margin or passepartout for a more classic fine art look.